Great Britain has a proud sporting history. Some of our traditional sports are less in fashion now (there are not a lot of Big Game Hunting or Pig Sticking enthusiasts around now). But the leisure pursuits of the moneyed classes produced many superb works with hunting, shooting and fishing as popular as ever. 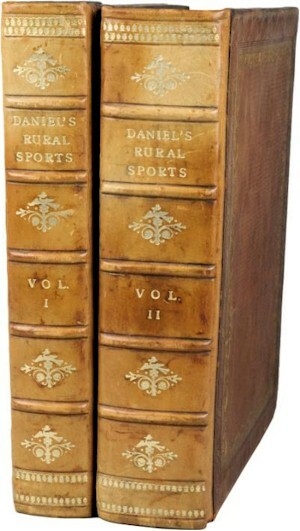 The two volume set Rural Sports by William Barker Daniel (BK9/322) realised £150 in our specialist rare book auction in February 2013. Of course, other sports such as cricket, golf and football are vibrant areas of collecting too. Works on country sports attract a lot of attention, and the illustrated works of people like Lionel Edwards, Cecil Aldin and Snaffles remain popular. These often appear in attractive limited editions, which give them an extra feel of quality. Wisden's Cricketers' Almanack is collected with as much enthusiasm as ever with the early and wartime editions being especially scarce. The Compleat Angler by Walton and Cotton is a perennial favourite and appears in many varied editions; and works on angling were being produced to a very high standard from the early 19th century onwards. Series such as the Badminton Library, which cover all aspects of British sporting life, make regular appearances at Book Auctions.